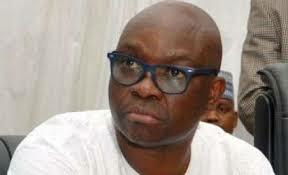 Governor Ayodele Fayose of Ekiti State has alleged that the administration of President Mohammadu Buhari and his ruling party, All Progressive Congress (APC) have killed democracy in Nigeria with the outcome of what he described as electoral fraud in Osun State on Thursday. He was reacting to the declaration of APC ‘s Gboyega Isiaka Oyetola as the winner of the September 27 re-run governorship poll in the state by the Independent National Electoral Commission (INEC). He described the conduct of the poll as a show of shame to democracy, adding that Nigeria will now become a laughing stock before democracy adherents and lovers in the international community. Fayose said: “With the show of shame that happened in last Saturday’s Osun state governorship election in general and the Thursday rerun in particular, there is no other conclusion to draw than that democracy is now dead in our beloved country”, he said. The governor who spoke through his Chief Press Secretary, Mr. Idowu Adelusi, decried the conduct of the governorship poll in Osun as well as its outcome, alleging that it is a perversion of the will of the people rather than an encouragement of democracy. Adding that the APC had killed democracy with alleged rigging machinery deployed in Ekiti State on July 14 and Osun on September 22 and 27 respectively, Fayose said, “With what happened in Osun state, democracy is actually dead in Nigeria and we are in critical times. The Osun supplementary elections was just a repeat of what happened in Ekiti State on July 14th. And it is unfortunate that, again, the will of the people has been perverted. Fayose added that the University professors also used as returning officers by INEC have, ab initio, been compromised and only serve the interest of those he described as their pay masters. Reviewing previous elections, Fayose said the ruling APC has perfected various forms of what he called “rigging plans, beginning with Edo, going forward to Ondo and Ekiti and now Osun state”. Fayose then condemned the violence that attended the election, sympathised with the families of those killed and enjoined PDP members to refrain from taking the law into their own hands, assuring that: “Help will come soon”.